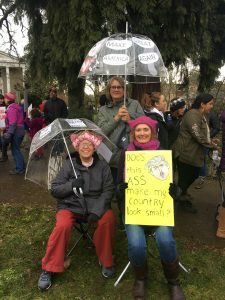 Juva, Nancy, and Leela at the 2018 Women’s March in Corvallis. Yes! We were there, but not altogether. Who knew it would be impossible for us to find each other in this small town? With between 3,000 and 4,000 marchers, most of the folks I knew who were at the march were impossible to find. I wandered around looking, but came up with no cohoots other than the one I arrived with, Juva (and saw Patricia, who was singing in the choir). Apparently, no other cohoots took photos of themselves at the march. We were present, but mostly photographically unaccounted for. 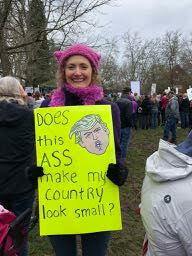 Posted in Community, Corvallis, Participation, Traditions, Uncategorized and tagged Women's March.